I've spent the last week or so of nights that I'm not gaming it up sitting with my lovely wife watching Netflix TV shows. We don't watch much TV that doesn't involve cartoons or tweens fawning over each other due to our kids...so at night, it's time to catch up on stuff we never got to see the first time. So shows like Lost, The Office, Firefly, and Spartacus: Blood and Sand got burned through and since I am the poster child for ADHD, I can't sit still and watch TV without wanting to spill blood. Thus, I spent a couple hours a night working on painting the figures for Castle Ravenloft. I'm not what you could call an expert painter, but I can make something that wasn't painted a little more colorful, and that's all I can ask for in this life. So, here's my final, painted Ravenlofties. All 42 figures, painted in about 14-15 hours, and it doesn't show how quickly I did them, for the most part. Click on the image for a larger one, if you want your eyes to bleed.. Yes, the paint schemes are unlike the D&D miniatures schemes, and I know it. How else would I be able to justify having Zombies sporting leopard print PJs, have the Hulk look like he's been stapled back together at St. Elizabeths, or have a "Cleric" look like a choir singer at a Southern Baptist church? Those are great colors. I would recommend you check out the "dip method" online -- it's a simple way to apply some wash to your figures to make them stand out. I think you'll be amazed at the results. I've used a wash as well as the dip before and they do make them "pop", I'd agree. In fact, I did the entire Space Hulk 3ed set using the Polyshades Antique Walnut and it turned out splendidly. That, and poly tends to cure too fast in extreme cold, so I shot them with dullkote instead to seal the colors. Just wanted them done, to be honest, and not look like grey/red/white nondescript monsters. Wrath is undergoing a paint job this weekend, I may toss a wash on them, especially the critters like the Otyugh, since they have a lot of abberation figs with cracks and lines on them. As it rests, I'm just drybrushing. Looks nice. 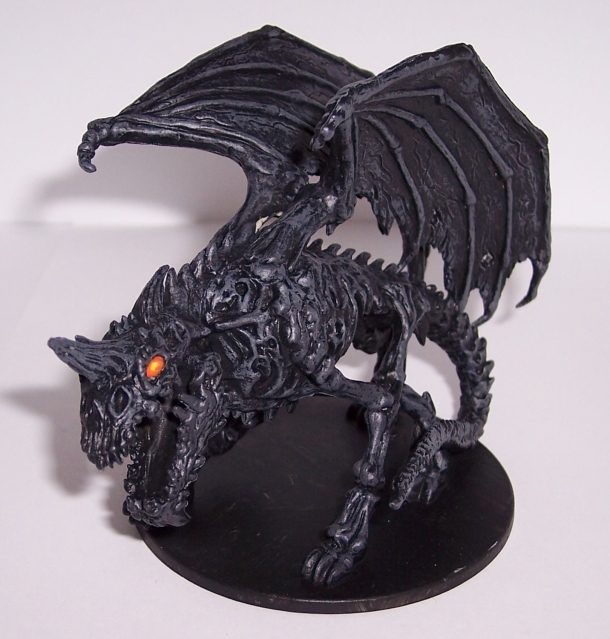 I love the all black dragon, sometimes the most simple paint jobs look the nicest. I would be scared to run into that guy in a dark castle.